Seems to be the season for events, and if you’ve yet to commit yourself to other arrangements, and you quite like the sound of seeing the New Year in surrounded by costumed, masked, revellers in the Steampunk style, then perhaps the Seductive Alchemy event in London is for you? The House of Wheat, ARTHOUSEPARTY, Zombies Ate My Brain and Unit 7 are all combining to create an evening that firmly declares itself to be Steampunk themed – with a strict no-mask, no-entry policy and a B.Y.O.E. understanding (Bring Your Own Experiment). They advise to think Absinthe fairies, mad scientists, gentleman adventurers and human lab-rats – which sounds marvellous. I’ve not found as much information as I might like, but it’ll run from 10pm to 10am, starts on the 31st of December in the Cable Street Studios, London, and they have DJ’s, Steampunk Punch and Judy, and pedal-powered cinema lined up. It sounds very decadent indeed. If I didn’t have other arrangements, I’d be rather tempted to try it out (any excuse for a nice Steampunk mask, of course) but if someone else should go – do let me know how it plays out. Thank you very much, Mr NK Guy! Mr Hayden found some rather well done photomanipulations of how certain popular gadgets and toys of today might look if they were given a more Steampunk feel to their look. Over at the somethingawful.com site, there’s a small but lovely collection by Eightcell including a Nintentdo DS, Wii, Wiimote and an Apple Ipod, all given a dark wood, brass and valve look. Does it say something about me that I instantly recognised the source of the murky orange tube on the left there? (Source image probably inspired by the Weta rayguns, I believe.) 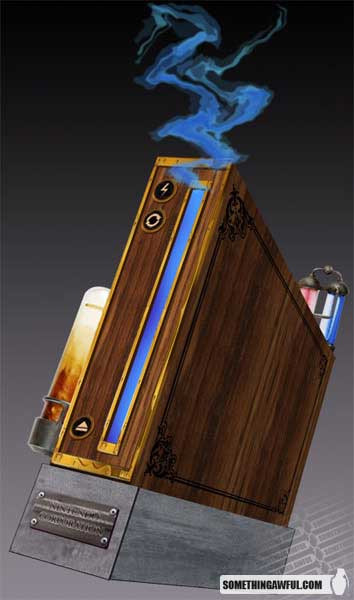 I’d certainly prefer to have a Steampunk looking Wii and Wiimote, than the (admittedly very sleek) white that it is presently. Very well found, Mr Hayden, and to the mysterious Eightcell creator – very well done indeed! You have an excellent eye. If you should find yourself in New York city in February of next year (2008), then you may be very interesed to hear that the Dances of Vice group will be hosting a two day Steampunk and retro event – the Dances of Vice Festival – of music, theatre, costume and Victorian fencing! Featuring artists such as Rasputina, The Deadfly Ensemble, The Blackforest Fancies and more – the highlight of the two day schedule to me sounds to be the grand neo-victorian costumed ball! The Dances of Vice group are not strangers to the Steampunk theme, having had several monthly events under their belt already which wantonly revel in themes and costumes from the early 20th Century and a good two decades on either side to boot. 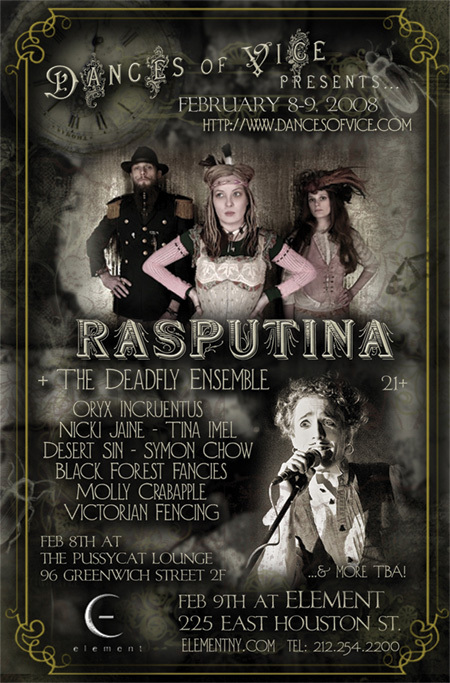 Do take a look at their website for more information, but I admit that just as I found the one-off Steampunk White Mischief event an impossible to resist temptation, the Dances of Vice Festival may well have me booking a trip across the pond! I wonder how airport security would view a gizmo-embellished top hat – perhaps not a hand-luggage item. Thank you, Ms Lee! Mr Medrano very kindly let me see a recent image that he created when inspired by the somewhat Steampunk novel “The Diamond Age” (Amazon – UK , US ) by Neal Stephenson. 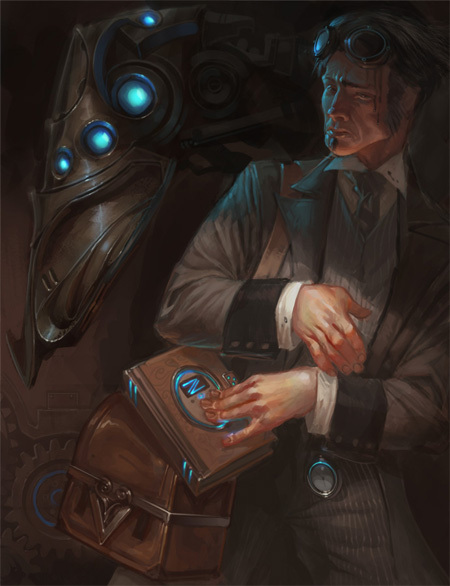 Also known as “The Young Ladies Illustrated Primer”, the image above shows the nanotechnology-powered book in question carried by a be-goggled gentleman with what looks like engine grease across his brow. A lovely, inspired, and beautifully realised image, Mr Medrano – thank you for letting me see it! The Temporal Council (est. 1845) owes its existance to the work of the original Time-Traveller, Lord Arabast Smythe and his time interfering device. 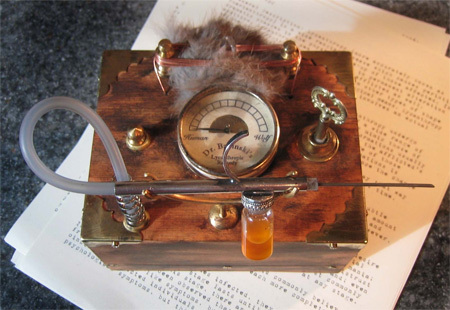 Admittedly constructed by a benevolent alternate dimentional version of Lord Smythe and gifted to his less academic self, our Lord Smythe used the device on many adventures and became the foremost time traveller of his, ahem, time. Devices such as the one above were eventually created – a beautiful (if somewhat elaborate) example of the Chrono-Interpositionists art. Yes, this is yet another stunning piece by AlexCF of Many Dead Things – a commision piece for the Solaris Publishing Group for use on the front cover of their upcoming Steampunk Anthology – Extraordinary Engines! So, not only a beautiful item (with a wonderful backstory, Alex – you could fuel a room full of authors yourself) but an excellent sounding book for it to grace the cover of! I look forward to not only reading stories from luminaries such as Mr Moorcock, Mr Di Filippo and Mr VanderMeer, but to have a professional photograph of one of Mr AlexCF’s pieces of art to gaze at between short stories. You excel yourself, Alex – though I hope you are giving Victorian-Science generated wormholes the respect they deserve! 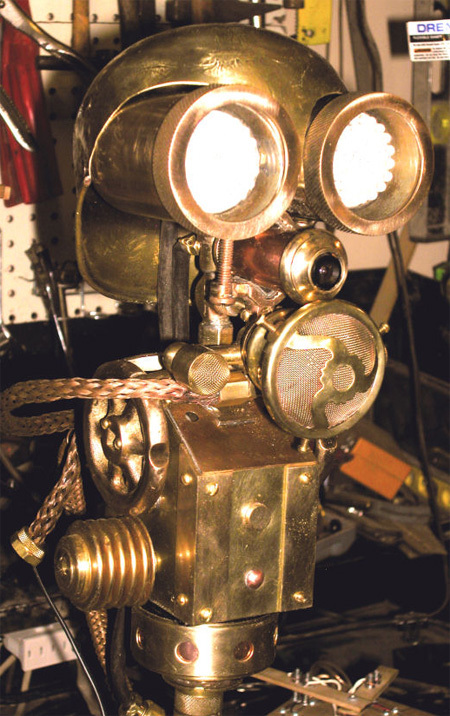 Mr Kaden Harris, of Eccentric Genius (what a well named site), sent word and images of this most dashing of Babbage contrivances – Marvin, the Anthropomorphic Concierge! Equipped, for your pleasure, with illuminator eyes, a Farnsworth nocturnal electronic eye positioned in his nasal position, an Edisonic vocaliser for a mouth and suitably positioned binaural microphonic array. Connectable via the universal serial data tram (bus is such a common word) this wonder of science is moved and positioned with a Phidget and is able to not only track persons and sounds around the room that it is located within, but is able to differentiate individuals! This was a commission piece, and I admit to having a rather unhealthy dose of envy for the ultimate owner of Marvin, tempered with admiration at coming up with such a wonderful request. Mr Harris – you have outdone yourself, and I can only hope that your patron is exceptionally pleased with the results! Perhaps you could furnish us with a cinematogram of Marvin going through his paces? Mrs Beverly (she of Jack and Beverly’s Images of Photographers) wrote to tell me about a lovely item they recently collected – a living picture, or clockwork tableau, from 1889 Germany. 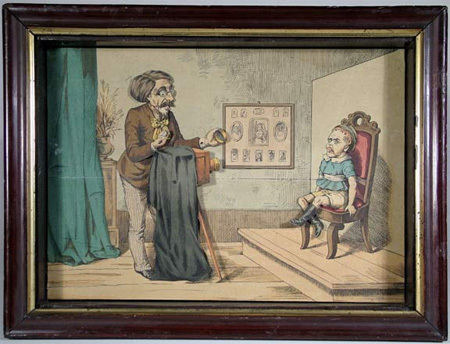 Showing a photographer with his troublesome victim or portrait subject, this coloured image set in a wooden frame has a clockwork mechanism at the back that controls the moving parts – the hand on the lens, the legs of the boy, even his tongue sticking out at the most inappropriate times! What a wonderful thing to have on your wall – simply wind it up and the little play acts out over and over. The photographer lifts off the lens and the boy starts playing up – apparently a common theme in early photography humour! There’s a video showing the movement over at Berverly and Jack’s site – high tech in 1889, I’m sure! Quite lovely, and the possiblities for other scenes, more Steampunk scenes, bubble over in my mind! I did try to find other information about Living Pictures and Clockwork Tableau – but instead I found an amusing wikipedia article on Tableau Vivant – particularly the amusing part about circumnavigating the English censors in WWII! Any more information about more of these lovely creations would be appreciated! 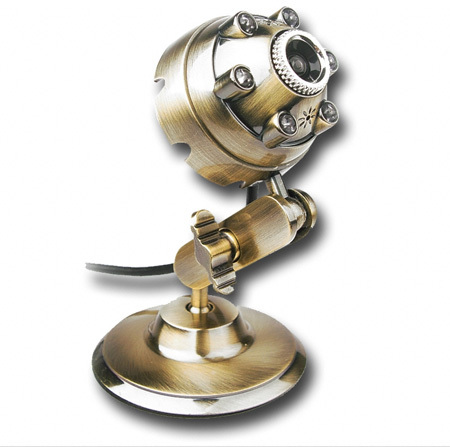 While I am not in the business of importing or redistributing manufactured items, I do think that the above item has some wonderful potential either for adorning a more Steampunk PC desktop, or as inspiration for others looking to craft their own, far more elegant version, of the evil eye of our computer world – the webcam. Found by Mr Andy Anonymous, and to be found at the importing site here, it seems that this surprisingly cheap (no doubt primed for mark-up) also has an adjustable light built into it for use in murky laboratories or appropriately moody studies. I really do think that with some careful and cunning craftsmanship, a rather impressive variation of this (perhaps including ‘helping hand’ magnification devices or alligator clips) could be constructed, possibly as part of a larger piece. Thank you, Mr Anonymous – you were right in your appraisal of the item! Many of you have noticed that the BrassGoggles.co.uk domain had been down for several days – this was due to a hosting security issue that has since been fixed. 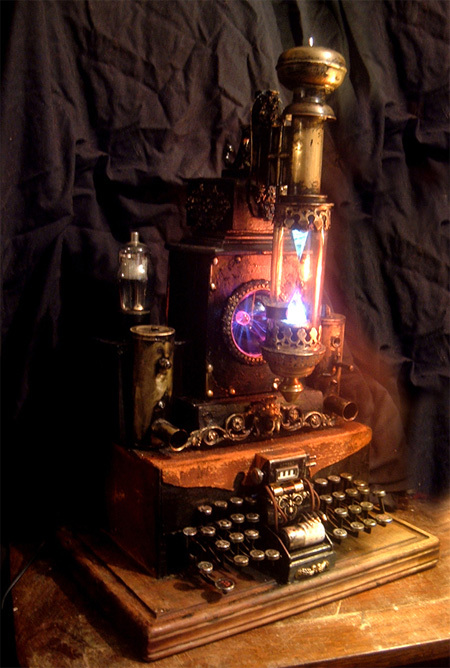 So both this blog, and the Steampunk Forum are now back up – do not adjust your goggles. Unless of course they require adjusting, in which case may I recommend a very small spanner, and to use your backup goggles as eye protection in the meantime. I apologise deeply for the downtime over the last few days. Mr Babinski has enjoyed a whirlwind romance with Steampunk recently – being caught up in the wonderful visuals that we’ve come to adore – and being an artist of no small skill it has come to infleunce his work. Above, you can see Dr. Babinski’s Lycanthropy Remedy, a rather grim looking device for both indicating what portion of the patient is lupine vs human, and one must assume that the curious and bilious looking fluid will either kill or cure the wolf portion of the victim. I mean, patient. Ahem. Constructed of Sterling silver, copper, wood and other found items, this really does look like a wonderful item for starting the most terribly interesting conversations over. There’s some other objects that Mr Babinski has created – some lovely wing and cog pins for example in his Steampunk Emporium of creations! Very well done, Mr Babinski!